The 2012 Elections Are Going To Heat Up! OMAHA, NE – With the 2012 elections beginning to heat up, its important for members of the LGBT Community and Democrats to be out volunteering and doing what they can for the candidates who will do the most for them. This election cycle, with Barack Obama, Bob Kerrey and John Ewing on Nebraska 2nd Congressional District ticket, we have, arguably, the most progressive ticket we have ever had and will most likely see in a while. Barack Obama, who has supported LGBT issues from the onset, has helped pass LGBT inclusive hate crimes legislation, repealed Don’t Ask Don’t Tell and now openly supports Marriage Equality is at the top of the election ticket again. Obama has also helped pass other legislation that will benefit the LGBT Community, especially the Affordable HealthCare Act. If you, as a member of the LGBT Community want to keep the rights we have won, the healthcare we deserve and have the best chance of more legislation to come, we need Obama in the White House for another 4 years. Don’t expect Romney to support LGBT issues, he will to try repeal everything we have accomplished in the last 3 years. Romney is too busy hiding his tax returns to care about LGBT people. Bob Kerrey, candidate for US Senate, is also a supporter of LGBT issues and has made statements publicly in the past. Most recently, he aligned himself with Obama on the issue of Marriage Equality. Bob Kerrey has also been vocal about the need to reach across the aisle. We need someone like Bob Kerrey if we are going to convince any more Republicans to come to our side of the fence on our important LGBT issues. Deb Fischer is too busy signing too many pledges to care about reaching across the aisle, and she is to worried about her entitlements to welfare ranching to care about LGBT issues. I’ve always thought there was something fishy about that Deb Fisher! 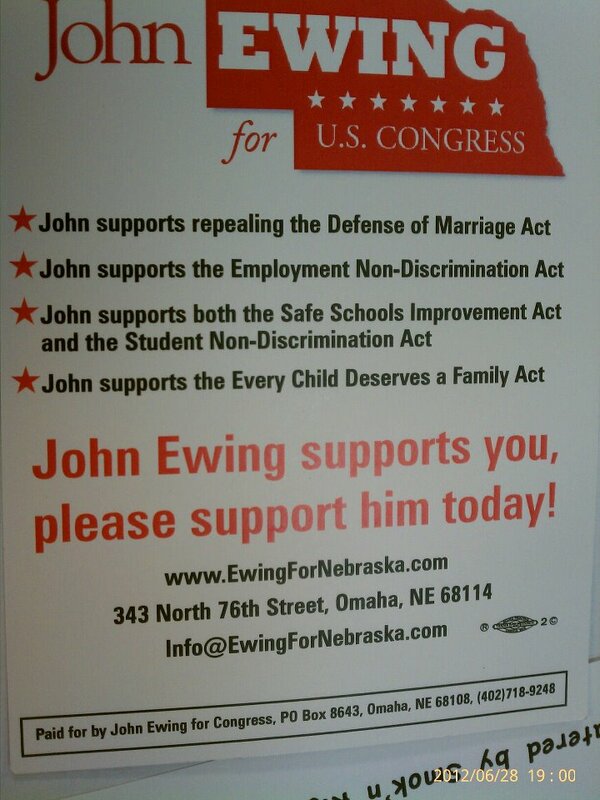 John Ewing, candidate for US House of Representatives, is another big supporter of LGBT issues. If you are not sure of his stance, I would definitely suggest you try and speak to him at his office if you can catch him there. Otherwise, I can tell you, I have a spoke to him, and he is a supporter. In fact, I am very confident that we as a community can get him to sponsor at least a bill or two (especially bullying) if elected to Congress, but first, we have to get him there. John Ewing attended Heartland Pride on that very hot Saturday and distributed flyers showing LGBT issues he supports. John Ewing also supports HealthCare reform, and received a very special endorsement from the Obama, “Have His Back“. This means whatever legislation Obama supports going through Congress, John Ewing will support it so we can finally get rid of this do nothing Congress and get things done in DC!! Lee Terry is too busy nodding his head to big oil, telemarketers, and other big corporations to worry about Omaha’s little LGBT community. John Ewing supports LGBT issues. What I’ve just shown you are reasons to register and vote, but just as important is helping out these campaigns by volunteering when you have time, canvassing when you can, phone banking when you can. Help our supportive candidates get to a place they will need to be to do our community the most good! The Obama For America (OFA) campaign has to very good offices, one in Council Bluffs at 1851 Madison Ave . The Council Bluffs OFA office is open M-F 9am-10pm, Sat 9am-7pm and Sun throughout the course of the day. The Omaha OFA office is by 343 N 76th st, that is near 76th and Cass, behind the KwikShop. That office is open M-F 10am-8pm and Sat 1pm-8pm. The Bob Kerrey office is located by 145th and F. The office is open from 10am-8pm M-F. The John Ewing office is right next door to the Omaha Obama for America office and is manned from about 10am-8pm M-F. The Greater Omaha LGBT Democrats is a group organizing to help LGBT candidates in the our area win their elections. If you have questions or would like be involved please contact the group’s Facilitator Ken Riter at 4O2-686-6389, please leave a message. Creating a Caucus to Protect WorkPlace Equality. Douglas County Democrats To Vote On LGBT Inclusive Measure! Elections 2012: Landslide For Equality, Part One.